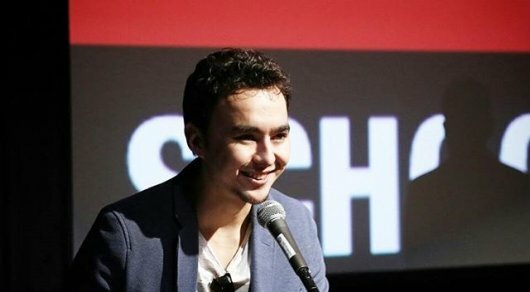 ASTANA – Twenty-six-year-old Kazakh actor and director Olzhas Nurbayev recently won Best Director at the Barcelona Planet Film Festival for his short film “The Boon” shot in Los Angeles. Olzhas Nurbayev. Photo from Instagram. “‘The Boon’ is a short feature I made for my graduation work at New York Film Academy. The film is about a homeless man whose life turns around after he finds a baby dumped in a trashcan. The film tells the story of two lonely individuals left behind by society,” Nurbayev shared with The Astana Times. The Barcelona Planet Film Festival is a monthly international event of innovative, independent cinema from around the world by up-and-coming artists. The film was shot at an old park in downtown Los Angeles. The location helped to convey “that atmosphere of dampness and cold,” according to the director. Starting his career in film as an actor in 2011, Olzhas Nurbayev acted for eight television series and varied projects in four years. Four of them were main parts and lead roles. “I was lucky to have worked with reputable productions, such as Sataifilm, Korkemfilm and Basproduction. To me, a film was always alluring from within. As an actor, I always paid attention to the way a light is set, how a director acquits himself, what is happening in that playback and so on,” Nurbayev said. He would often sit down beside directors when he was free and through the screen observe how a film is being made. “I used to like doing that and was attracted to it for some reason. Somewhere along the line I realised that I need to make my knowledge in film more profound and made a decision to go overseas,” he continued. Nurbayev chose to do a master’s degree in directing at New York Film Academy in Los Angeles. After a year of preparation and exams, he entered the academy via the Bolashak programme. Prior to that, Nurbayev was hosting a programme at the Perviy Kanal Evraziya (First Channel Eurasia) local Kazakh television station. “I have the biggest and spicy plans, but now I do not see reason to share them just yet. I simply want to film, create and tell stories through films,” he added. At present, Nurbayev is considering a number of interesting offers. He also decided to premiere the screening of “The Boon” in Almaty. “After some achievements that this film had at four festivals in the U.S., Canada and Spain, people often express a wish to watch the film. It is only pleasant to me. Why not, let us do it,” the director said.